This years Play Hard Event was another successful event thanks to all of our loyal supporters and many new ones. The night started out with music from Allen Nivens and local band Doghouse. Both got the evening going with their great sounds and set the mood for a fun night. The silent auction drew lots of attention and raised more money this year than in years past. Finally Drivin N Cryin rocked the house and made us all feel like we were back in college. The people there made the night what it was…..a fun night with lots of positive energy raising money for a positive cause…. Tyler’s Way…..Family, Community and Character! The 2nd annual Play Hard Event was held on Saturday, May 3rd, 2014 at the new 37 Main in Johns Creek and once again featured Davin McCoy and Drivin N Cryin. We were excited to also add to this year’s line-up, the Doghouse Band. The event drew in a great crowd of over 700 people. The online and silent auction was also a big hit again this year. The event raised over $30,000. Thank you to all of those who worked the event, donated and to those who came and showed your support! 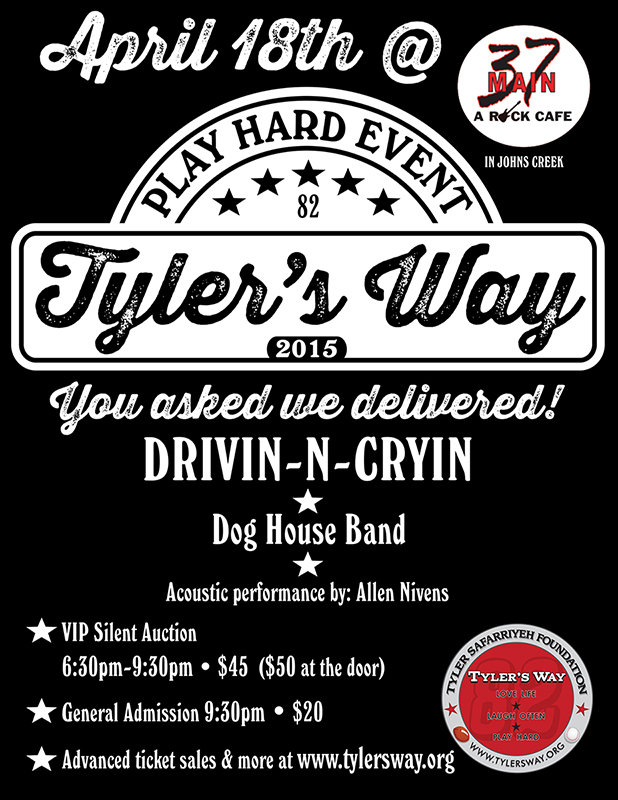 Our 1st annual Play Hard Event was held Saturday, April 20, 2013 at Park Bench and featured Drivin’ and Cryin’ and Davin McCoy and raised almost $25,000 for the Tylers Way Foundation. What a wonderful night!